.:. 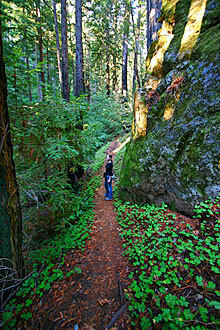 Hiking in Big Sur - Ewoldsen Trail/ Canyon Trail .:. The wonderful thing about the Ewoldsen trail is that it offers a highly scenic sampling of what you find with most Big Sur trails east of Highway 1. You've got your old growth redwood forest, scrub landscapes, sweeping canyon and ocean views, and a nice bit of elevation gain. Look for the Ewoldsen/Canyon trail sign at the eastern end of the parking area. The trail immediately heads into the lush redwoods along the north side of McWay Creek, and threads through the trees to the first of several bridges. Right after the first bridge is a spur to the left that heads up the creek a ways and then dead ends at Canyon Falls. Instead, take the right fork to continue up to the loop. After a steep switchback climb, you'll walk through more redwood groves, cross another bridge and hike above the creek until you find yourself at the beginning of the loop proper. The loop starts roughly a mile from the parking area, and is a two mile round trip. For the most scenic views on the loop, go right (counter-clockwise) where you'll wind your way around McWay Canyon, criss-crossing the creek several times among spectacular redwood trees and huge rock formations. You'll soon emerge from the forest along the sides of the canyon for some sizable views of the surrounding area. About half way around the loop, you'll come across a turn off on the right for the view point. By all means take this little side detour up the side of the hill! The path is fairly short and ends up at an exceptional coastal vantage point where California Condors have been known to roost. You are now up with the oak trees and this is a great spot to take photos or even hang out and have a snack. Head back down to the loop, and continue along to another spectacular ridge above Highway 1 where you can see evidence of recent massive erosion control efforts. The trail along the ledge here is narrow, so be careful not to slipyou would likely end up in the middle of Highway 1 a thousand feet below! The loop eventually returns you to its beginning, where you'll want to turn right back onto the path to the parking area. If you take this trail later in the afternoon, the return trip after the loop offers a sublime view of the sun streaming through the trees as it lowers in the west. Head up the short Canyon Falls spur described above for a view of the 30 foot falls. If you only have a short time for the Ewoldsen trail, heading straight to the falls and back and skipping the loop is a good strategy. And if you haven't already done it yet, head west across the parking lot and go see McWay Falls. If you park in the official parking area, go to the east end of the lot and look for the trail head and sign. Visitors can also park for free outside of the park along the west side of Highway 1. If you do park here, you'll want to head east across the highway and towards the parking lot to your left.